Taking baths instead of showers is a great way to make your plumbing more energy efficient and conserve water. Saving energy and conserving water has been a top priority for many homeowners nowadays. Not only is there a concern with lessening a homeowner’s impact on the environment, but people are also discovering that making their homes more energy efficient also has a positive impact on their utility bills! Reducing your water use at home is a great way to save a decent chunk of change every month and that money can add up over time as well. Here are three ways you can make your plumbing more energy efficient to consume less water. If your toilets are over a decade old, it may be time to consider switching to a new low flow commode. Toilets are one of the biggest consumers of water in a modern home, and new low-flow models use much less water than older models – in some cases, water consumption can be reduced by up to 60%. Faucets account for as much as 15% of annual water consumption. Malfunctioning faucets can cause a lot of waste through leaking and other problems. Have your leaky faucets repaired or consider switching to a more efficient setup. New high-efficiency faucet systems can reduce the water consumption from your faucets by as much as 30% annually, saving you a bit of money in the process. Our daily showers put a significant strain on our water supply. The standard showerhead puts out water at a rate of around 25 liters of water per minute, making it a leading consumer of water in the average home. Replacing your malfunctioning showerheads with low-flow models can make a difference in conserving water. These showerheads reduce the amount of water being consumed without compromising on water pressure. Homeowners can also stop taking showers and opt for baths instead. 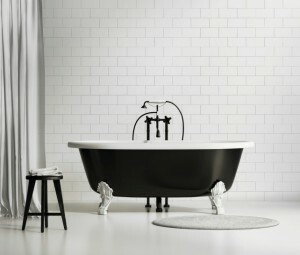 The average bathtub holds 70 liters of water, or the amount of water put out by a shower in under 3 minutes, so you can conserve a lot of water by taking baths instead of showers! This entry was posted on Thursday, February 23rd, 2017 at 9:49 pm. Both comments and pings are currently closed.